Surviving in space is perhaps one of the greatest challenges of our recent past, current and future generations. Pioneering into the final frontier as scientists, and even colonists, is imbued with potential answers to thousands of questions (philosophical, biological, environmental and perhaps agricultural) back on earth. In 2016, two astronauts will have survived the longest time on the International Space Station in history, accounting for 342 days in space. As we continue to test the ability of the human body to adapt to the foreign environment outside of our atmosphere, the challenge to survive in space is replaced with the challenge to live in space. 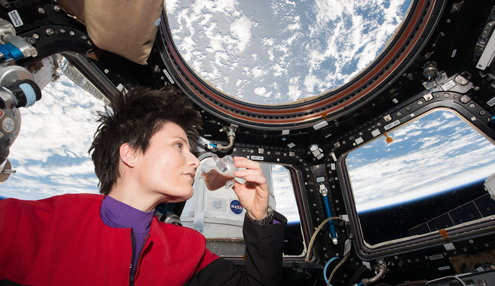 One way scientists are confronting the problem of making space feel livable is through engineering cups that allow astronauts to drink with the familiarity of home while within microgravity. The simplest pleasures – eating and drinking – become a labyrinthine puzzle for scientists to tackle once taken out of the context of earth’s gravity. IRPI is the engineering consulting firm NASA relied on to bring the comfort of drinking out of a cup on earth to the harsh environment of space. To create a drinking cup in microgravity, IRPI looked to 3D printing to solve what appeared to be an insurmountable challenge. In a nutshell, capillary flow results from a pressure gradient in the liquid resulting from exploiting the liquid’s surface tension, wetting condition, and geometry of the cup. Studying the way fluid reacts and moves across surfaces in microgravity is an important undertaking; fluid systems are involved in all aspects of space craft, from life support, to liquid processing, to plant and animal habitats, to heat exchangers, to liquid fuel. Solving the challenge of moving liquid within a cup along the right surfaces – up from the bottom and towards the drinker’s mouth – required a complex geometry conventional manufacturing technologies couldn’t undertake without prohibitive costs. IRPI partnered with Stratasys Direct Manufacturing to manufacture the Space Cup using the only viable technology: 3D printing. Stratasys Direct Manufacturing and IRPI worked to prototype over 40 and eventually manufacture 12 Space Cups using Stereolithography 3D printing. “Stratasys Direct Manufacturing was with us from concept prints, material selection, scale test models, and final products,” states Drew. The team chose to manufacture the Space Cups with Accura 60 material and Stereolithography for three reasons: Its accuracy, fine resolution, and the material’s optical clarity. Stereolithography offers some of the best tolerances for 3D printing at ± .005” or ± .001”/” (whichever is greater). Its finest layer thickness, 0.002”, directly relates to the smoothness of the cups’ surfaces. “The most important aspect of the 3D printed cup was the aesthetics; the Space cup had to look good,” explains Drew. “Additionally, the geometry of the cup is the key determining factor in the cup’s performance, therefore accuracy of the machine and post-processing had to be maintained for success.” Any imperfections in cup geometry would impact liquid flow. It was critical to the project’s success that the cups be smooth, clear and appealing to drink from. Stratasys Direct Manufacturing’s expert Stereolithography engineers brought their years of experience to the project to combine the right beam length (UV laser), layer thickness, and design orientation to produce the results IRPI required. IRPI handled finishing of the cups to meet stringent food-safe requirements and to achieve the surface finish needed for accurate data collection. Fused Deposition Modeling (FDM) was used to create the sturdier cup stands while Stereolithography produced ~40 Space Cups and prototypes. After conducting microgravity tests with the Stereolithography cups on earth, the Space Cups were almost ready to make their journey to the International Space Station. However, to get to the station, the cups had to survive the journey itself and that required additional testing to ensure the material passed NASA’s flight requirements. “IRPI handled achieving NASA’s flight certification of Accura 60 material, which was not an easy task.” states Drew. With simulated microgravity tests completed, flight certification from NASA, and geometry successfully executed thanks to 3D printing, the Space Cups made their way to space. “The Capillary Beverage Experiment was a success,” states Drew. “Six unique Space Cups went to the ISS aboard SpaceX-6. Over the past year, we have had 10 flight operations in which astronauts conduct experiments and demonstrations of the Space Cups in action as directed by our team on the ground.” American astronaut Scott Kelley, who is set to break the record for longest stay on the International Space Station in a few months, took his first sips of coffee from the cup with positive reviews. American astronaut Kjell Lindgren was able to use the cup to brew coffee in space for the first time. Even our international partners enjoyed drinking from the cup in space. Japanese Space Agency (JAXA) astronaut Kimiya Yui expressed pleasure in drinking from the gravity simulating Space Cup. 3D printing has opened doors to new frontiers in manufacturing, giving scientists and engineers the opportunity to venture into designs that have never been physically manifested before and provide solutions beyond our wildest dreams. It’s an exciting time on earth and in space!